Welcome to the March 2018 edition of the Equity Lens! In this edition we recap a successful legislative session, profile CCC leaders, and highlight the work of our members, partners, and community leaders. Welcome, Nakisha Nathan, CCC's New Leadership Development Director! Together we’re building the power of our communities for racial justice across cultures. Summer Soirée is our chance to come together as one community for an evening of conversation, idea sharing and inspiration. 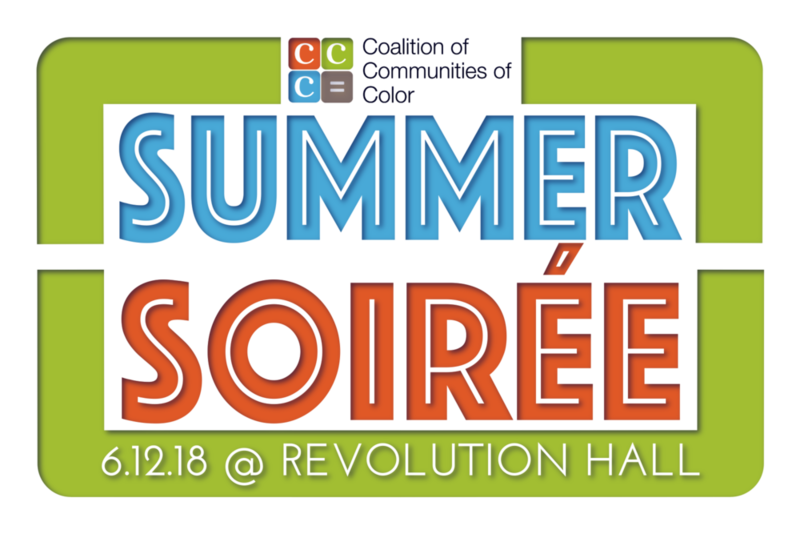 Join us June 12 at Revolution Hall for a dynamic program, live auction and happy hour, and let us toast to the future of our collective action. 2018 Legislative Recap: How did racial equity fare at the 2018 Oregon Legislature? The Legislature adjourned for 2018 on March 3, and while we saw significant progress for racial equity, there is much work to be done in 2019 and beyond. There were multiple victories in housing, along with important new legislation impacting the health and wellbeing of families. See our earlier legislative recap for more background on these bills here, and our entire 2018 legislative agenda here. Families are at the heart of our communities, and ensuring that children are not unnecessarily removed from their homes, and that families have a path to restoration, is critical to keeping our families strong. This session, Rep. Tawna Sanchez took action to support families as the chief sponsor of HB 4009. As introduced, HB 4009 would have required judicial authorization before a child could be removed by the state, meaning that kids would remain in their homes so long as they were safe. Currently, children of color are removed from their homes by child welfare services at far higher rates. The bill also created an opportunity for children who are waiting to be adopted to be reunified with their families by reinstating parental rights under certain circumstances when it is in the best interest of the child. The final version of the bill only included the second provision. While we are very disappointed that the removal provision was eliminated from the bill, CCC is dedicated to continuing this conversation to ensure families have the support and resources to thrive. The amended bill passed out of the Legislature, meaning that children will have the chance to be reunified with their families, and we applaud Representative Sanchez’s leadership in passing this critical bill. All of our priorities in housing and health passed this session! Increasing resources for affordable housing: Stable homes are the foundation for strong families and communities. Affordable homes are scarce throughout our state, and families of color are some of the most impacted by rising housing costs. HB 4007 increased the document recording fee and will raise an additional $60 million for affordable homes, emergency rent assistance, and homeownership programs. Addressing racial disparities in homeownership: Homeownership is one of the most effective means to create housing stability and strong communities, and is also the main driver for wealth creation. Communities of color face dramatic disparities in homeownership rates, and the task force established by HB 4010 is a step toward increasing access to homeownership for these families. Thank you to Rep. Mark Meek for his work to advance racial equity in housing. Removing racist restrictive covenants: Restrictive covenants based on race exist in the titles to an untold number of Oregon homes, a stark reminder of our state’s history of legalized racism. While no longer enforceable, the process to remove these covenants is cumbersome. HB 4134 will ease the process to remove these covenants. The impact of these covenants and other ongoing inequities continue to this day. Advancing maternal health: The Legislature passed HB 4133 to establish a maternal mortality and morbidity review committee. African-American mothers face extreme disparities in maternal mortality rates, and this review committee is a step toward improving the health outcomes for mothers of color. Thank you to Representative Janelle Bynum for her work to pass this critical legislation. We are disappointed that a number of priority items were left unfinished this session, and need to be at the top of the Legislature’s agenda for 2019. Early Childhood Equity Fund: HB 4066 would have established a fund to invest in culturally specific early learning programs with proven records of success. These highly effective programs have been left out of the early learning system long enough. Due to the Legislature’s failure to commit resources to these critical programs, children of color across our state will have to wait another year due to the Legislature’s failure to commit resources to these critical programs. Paid family and medical leave: Workers of color are disproportionately impacted by a lack of access to paid leave, and the Legislature must act in 2019 to ensure that workers’ income is protected when they need to care for family members or recover from a serious illness. Small donor elections: A small donor elections program would strengthen democracy by breaking down barriers to running for office and amplifying the voices of Oregonians, including communities of color who face systemic barriers to building wealth. Bold action on climate: This session ended with preliminary steps toward a Clean Energy Jobs program. CCC and its members will continue to push for environmental justice to be at the core of its climate policy. With the adjournment of the 2018 session, it’s time to begin planning for next year and building power to advance racial equity. Legislators of color took action on urgent issues impacting communities of color and helped center conversations around racial justice. 2018 saw the most diverse group of legislators yet, and we look forward to next year’s long session with legislators of color leading the way to find solutions that will lead to a better Oregon for all of our communities. The PAALF People's Plan lays out a vision of a thriving, empowered Black community and asserts the right of Black people to be in and shape community no matter our neighborhood -- from the North to the Numbers. The plan frames a Black community policy agenda and advances community-initiated projects as a powerful tool for organizing, advocacy, and implementation. The Plan is a result of twenty-six community events, which engaged over 400 Black community members using varied engagement approaches. PAALF People's Plan is strengths-focused, moving from simply naming issues to collectively building solutions for our community. This represents an empowering transformation in the community engagement process. Learn more at https://www.paalf.org/paalf-peoples-plan/. PAALF also launched a successful project to purchase and preserve the 113-year-old Gordly-Burch family home located at 4511 N. Williams Ave in Portland, Oregon, and establish a cultural center honoring the historic heart of Oregon’s largest African American/Black community. The property has remained in the Gordly-Burch family since its purchase in 1949. At that time uncensored racial prejudice and antisemitism were pervasive, including racist property laws that prevented African Americans from purchasing homes and redlining that prevented lending to purchase homes. The Gordly family, however, was able to purchase the home from the Jewish residents willing to help root the family in the neighborhood. The home remains an important piece of the family’s history and an important artifact of the racial justice movement from the 1950s to present day. The family members included Mrs. Beatrice and Mr. Fay Gordly, their children-- Avel Gordly, Faye (Gordly) Burch and Tyrone Gordly. The Gordly-Burch family continues to be a symbol of self-determination in the Black community. The family has a long history of helping to advance community empowerment. Mr. Fay was a railroad worker with the Brotherhood of Sleeping Car Porters and Maids labor group a Mason and active with the A Phillip Randolph movement, and Mrs. Beatrice was a long-time member of Mt. Olivet Baptist church and a Grand Worthy Matron of the Eastern Star. Faye Burch, previously Governor Barbara Roberts’ Senior Policy Advisor and later serving as the Advocate for Minority and Women- Businesses, She was a co-owner of five gift shops and a small food service restaurant at the Portland International Airport for twelve years while building her business as a Project Development consultant, business leader, public policy advisor, community activist. In that role, Ms. Burch has coordinated over a Billions of Dollars of opportunities for Minority and Women Businesses and job training programs. Ms. Burch received a Congressional appointment and served on a National Small Business Commission holding hearings in Alaska, Washington, California, and Virginia. Her business has received several U.S. Small Business Administration awards and recognition in the field of construction as a Woman of Vision and a Newsmaker. The Honorable Avel Gordly was the first African American woman elected to the Oregon State Senate, representing a geographic area that included the predominantly Black area of North and Northeast Portland from 1991 until her retirement in 2009. Her legislative record included initiatives that focus on cultural competency in education, physical and mental health, and the administration of justice and the development of legislation that continues to benefit low-income communities of color, young children, the elderly, and other vulnerable Oregonians. She served on state committees including Joint Ways and Means, Education Policy, Trade and Economic Development, and Environmental Quality. She advocated for and then co-chaired former Governor John Kitzhaber’s Task Force on Racial and Ethnic Health and established the nationally recognized Governor’s Environmental Justice Task Force. Climate justice and energy democracy has been lifted up as a key priority for our members. For this reason, the Coalition of Communities of Color has endorsed the Portland Clean Energy Fund after serving a key leadership role in its design. The Portland Clean Energy Fund will provide job training, apprenticeships, and minority contractor support to weatherize and solarize Portland homes and businesses, make energy efficiency upgrades for affordable housing, build clean energy infrastructure, and increase local food production. Funding and initiatives are targeted to ensure opportunities for communities historically left out of the economic engine. Funding for this work will come from a 1% Business License Surcharge on billion-dollar retail corporations operating in Portland. We are asking for just 1% from the top 1% to address the pressing issues of racial inequities, growing economic inequality and climate change. At a time when so many of us have to say NO far too often, this initiative is an opportunity for Portlanders to say YES in a big way. We can serve as a national model in responding to climate change and economic inequities by creating a Just Energy Transition. Please sign up here to learn more about the Portland Clean Energy Fund! What is the role of non-Black communities of color as in the movement to dismantle anti-Black racism? How do we organize ourselves and how do we build a new model as comrades and co-strugglers that is different from white model of allyship? Hyejin Shim poses a series of questions for the Asian and Asian American communities that pushes us to think beyond the ‘model minority myth’ to how we understand ourselves and the stories we tell in the context of the movement for Black liberation. Metro, with assistance from community advisory committees, is developing a potential framework for a housing bond to increase housing stability and affordability throughout the region. After a community engagement process, Metro Council will decide in June whether to refer the bond for the November ballot. The Coalition of Communities of Color has been sitting at the community stakeholder advisory committee, along with a number of CCC members. We are working with our member organizations to ensure that racial equity is at the center of Metro's bond framework. Djimet explains that there is often minimal discussion around climate change, let alone climate justice, at national levels in many African countries, and that many African immigrants and refugees arrive unfamiliar with U.S climate change rhetoric. This leads to an important solution for Djimet, education. In 2017, Africa House and the Portland African American Leadership (PAALF) were awarded a grant through Meyer Memorial trust to conduct environmental justice strategic planning, community education and engagement, and advocacy agenda development through their “Afro-Ecology Series.” This process (to be completed in Spring 2018) will result in a strategic environmental justice plan prioritizing actions that reduce and eliminate environmental disparities and ensure the equitable distribution of benefits, including increased economic opportunity and investments. This collaborative effort will result in building and supporting leadership to identify and implement climate solutions. This is the first step to increasing opportunities for Africans and African Americans to build a base and have access to decision-making processes. 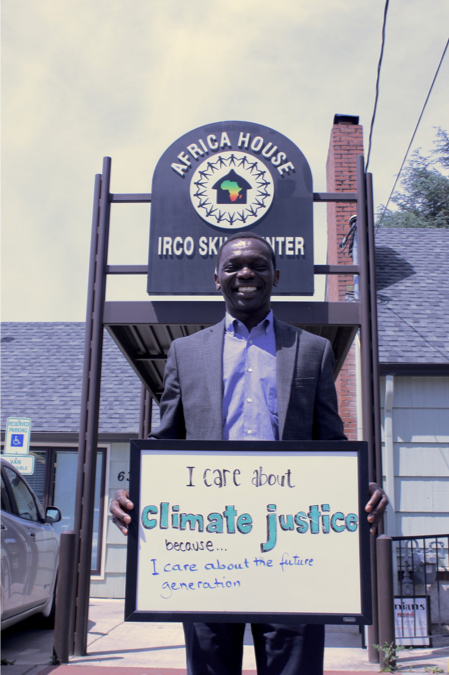 Africa House, through a Gray Family Foundation grant, has also developed a multigenerational curriculum about climate change to share with African immigrants and refugees and to incorporate into the African Leadership Development Institute, one of CCC’s culturally specific leadership development programs. Africa House hopes to break down perceptions of environment and climate, which are often framed as political rather than spiritual and social. The environmental movement, Africa House found, should be rooted in self-determination, justice and spiritual connection to mother earth. Climate (in)justices not only drive displacement from home countries but also affect African immigrants and refugees in Portland and around the State of Oregon. Frontline communities—communities of color, low-income communities, tribes, rural communities, immigrants, and refugees—are hit first and hardest by climate change and the pollutants that cause it. Climate change effects like drought, famine, heat waves, storms, polluted air, and water, expanding deserts, flash floods, etc, dictate so much of what African immigrants and refugees experience. Because climate change impacts immigrants and refugees first and hardest, their voices must be amplified and included in climate change efforts that have long excluded communities of color. **Africa House, founded in 2006, serves about 5,600 community members from 22 ethnic and cultural backgrounds each year and is staffed by a multicultural team representing 17 ethnicities and speaking 10 languages. Africa House is the only culturally and linguistically specific one-stop center targeting the increasingly diverse and rapidly growing number of African immigrants and refugees living in Oregon. Africa House has received national attention for moving beyond intercultural strife to be the only center serving Africans from every country in the continent. Nakisha believes that our communities flourish when we work together in mutuality, celebrate our diversity and highlight the development of our leaders as they self-organize, build power, and implement strategies for self-determination, wellness, justice, and prosperity. Nakisha’s commitment to advancing social justice stem from spending her formative years living in Panama, Canada, Texas and throughout the United States. Her exposure to a variety of cultures, injustices, and ecological degradation contributed to her desire to facilitate transformational leadership that honors and celebrates individuals, communities and our natural and built environment. A few years after graduating from Texas A&M University with a degree in bioenvironmental science, Nakisha began her leadership development journey as a community organizer with Texas Campaign for the Environment, where she and her colleagues generated statewide pressure that helped convince Dell and Apple Computers to establish a free Computer TakeBack program. Later, as a legal assistant for an environmental law firm, she continued to support community leaders who seek to protect their neighborhoods from polluting industries. In the Summer of 2012, Nakisha moved to Portland and began her studies toward earning a Master of Science degree in Education, with a specialization in Leadership for Sustainability Education from Portland State University. During her time at PSU, she worked as a STEAM Garden Educator, cultivating students’ curiosity and facilitating experiential learning opportunities. Nakisha joins us after working as a Climate Justice Organizer at Oregon Sierra Club Chapter, as a Community and Environmental Justice Organizer with Neighbors for Clean Air, and as the Program Coordinator for the Organizer-in-Training program at OPAL Environmental Justice Oregon. Nakisha serves as the co-chair of the Portland African American Leadership Forum’s Environmental Justice Committee, and continues to work with OPAL Environmental Justice Oregon and Neighbors for Clean Air as a member of each organizations’ Board of Directors. When she’s not at work, Nakisha can be found playing a variety of games with her friends and family; camping with her partner and two dogs; photographing Oregon’s natural landscapes, flora and fauna; or, gleefully pursuing her quest to find every member of the Araucaria Araucana species (Monkey Puzzle Tree) in Portland. On Saturday, March 10th, leaders from six culturally specific leadership development programs came together and learned about each other’s values, perspectives, and experiences at CCC’s 4th Annual Bridges Convening. Our keynote speaker and workshop facilitator, Robin Johnson, with the Center for Equity and Inclusion was the highlight of the event. Robin’s presentation balanced insightful information with personal storytelling to illustrate how people recognize the impacts of racism and privilege on their values and become empowered to begin collaborating in coalition with one another. Hopefully, those who were in attendance at the end of the program have had a chance to reflect further on the questions Robin posed at the close of the convening: How has the cycle of empowerment shaped your cross-cultural values? How do you intend to advance social justice or dismantle oppression through your personal work and your collective work? Participants were thrilled to hear from guest panelists Becca Uherbelau, Laura Vinson, and Mary Moller who joined us from Metro, Lane County, and the Governor Kate Brown’s Office. Panelists spoke and answered questions about how our leaders can take advantage of opportunities and partnerships to increase their influence and access to more decision-making spaces for greater impact. Over fifty Bridges Directory profiles were updated, and we received valued input from folks about how the directory can further support our leaders. This year’s convening also provided space for people to hear about and provide thoughts on how we lead the way in the creation of a clean energy future for our communities. The discussion included details about the ballot initiative for a Portland Clean Energy Fund that would raise $30 million per year to create solutions for climate justice. Alumni and current leaders were invited to share their stories and values all throughout the event and the energy felt during these moments of cross-cultural learning and understanding was tangible! We’ve since heard from numerous participants how meaningful it was to hear from leaders in other programs and look forward to creating space for more cross-cultural collaboration. We were all further energized by a brief but joyful performance by Leonid Nosov who played the bayan (accordion) between the two-afternoon sessions. And a dozen of our leaders became spontaneous dancers and musicians during Chata Addy’s comedic, instructional and interactive performance! Stay tuned to find out more about how this convening will continue to inform our work, and the work of our new Leadership Development Director, Nakisha Nathan. In the meantime, we encourage folks who haven’t done so to update their Bridges Directory Profile! Happy Holidays and welcome to the December edition of the Equity Lens! In this edition we reflect on the work of our members, partners, and community leaders. As the year comes to an end, many of us are reflecting on a year filled with unprecedented challenges. With each challenge our coalition members responded with resilience, grace and hope. Despite a toxic national discourse, our 19 member organizations and the communities we serve focused on how to respond to community needs and how to shift the narrative by placing children, families and community in the center. Our communities looked toward a future more reflective of our shared values and collective belief in the strength and assets of communities of color. Amidst a shadow of fear, the CCC and our members worked collectively with community to stand up, raise our voices and push back. The Coalition of Communities of Color and our members were extremely productive in 2017. We worked with community to convene focus groups, discussion groups, information sessions and work groups to inform and drive community based research and advocacy. 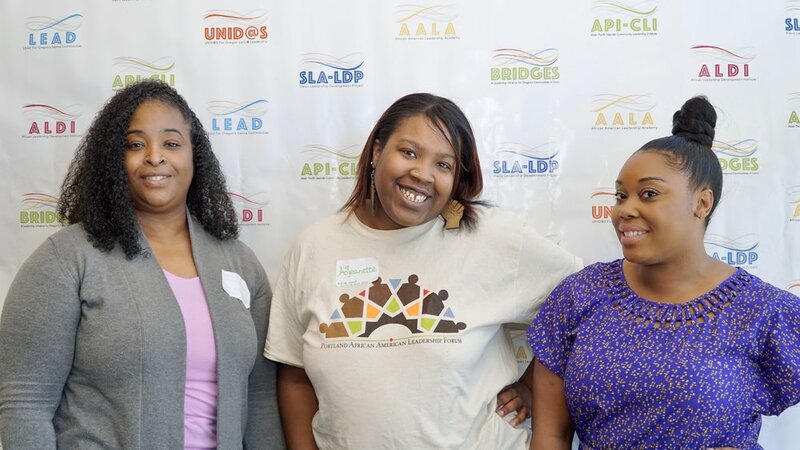 We developed and trained leaders who in turn used their skills, passion and advocacy to lobby decision makers and advance important policy changes that will positively impact communities of color. We continued to develop, support and strengthen relationships with established and new partners. And we made time to celebrate each other, communicate our successes and plan for 2018. If you are as inspired as we are, we encourage you to consider making an investment in the success of the CCC and our members though a donation. Your support will help the CCC and our members continue to provide vital services, programming and advocacy in support of racial justice in Oregon. This year, several of our member organizations are in Willamette Week’s Give Guide (www.giveguide.org): Hacienda CDC, IRCO, KairosPDX Learning Academy, Latino Network, NAYA Family Center, SEI, Urban League and Voz. You can support them by donating through the link. The Coalition of Communities of Color is excited to welcome its newest member, the Muslim Educational Trust! Tell us about your organization and its mission and services. The Muslim Educational Trust (MET) is a cultural, social, and educational institution founded in 1993 with a mission to enrich the public’s understanding of Islam and dispel common myths and stereotypes, while serving the Muslim community’s educational, social, and spiritual needs in order to develop generations of proud and committed Muslims who will lead our community to the forefront of bridge building dialogue, faith-based community service, and stewardship of Earth and humanity. MET engages extensively with the broader community to foster the general public’s understanding of Islam and raise awareness about the importance of equity and social justice for all. Our work includes monthly public forums for community members to engage and grow closer in mutual respect, understanding, and compassion, public lectures, interfaith dialogue, outreach to local media organizations, cultural competency training, the Know Your Neighbor Campaign, the Silk Road Cultural Diplomacy program, and efforts to highlight Muslims in the public square across all professions. This work leads to consciousness of our stereotypes and reshaping our mindset to see each other as equally human. Our work supports positive integration for new immigrant communities, civic engagement, leadership development, education, outreach, and partnerships with government officials to make the Muslim community’s voice heard. Promoting collaboration between Islamic organizations in the Portland metro area and Southwest Washington is another way we are strengthening our community. MET is the co-founding member of the following interfaith organizations and coalitions: the Institute for Christian Muslim Understanding, Arab-Jewish-Muslim Dialogue, Interfaith Council of Greater Portland, the Beloved Community of Oregon Coalition, and Between Women Interfaith Group. What are your top priorities and hopes for 2018? In 2018, we will be working to expand programs to reduce fear and build bridges of compassion and understanding of Islam and Muslims in light of current political landscape. To this end, we will continue our civic engagement, education, and outreach work, as well as positive integration for new immigrant communities. The sustainability of our program is another major priority, as we work to pay a $4 million construction loan to complete the center and expand an endowment to sustain the organization for the long-term. What do you look forward to about being a member of and working with the Coalition of Communities of Color and its members? MET spends a significant amount of time working with and supporting our local immigrant and refugee community, most of whom are people of color. We believe that our perspective can be an added value to the Coalition, and we hope to, in turn, learn from other local organizations about their communities and how we can better support each other. The goal of CCC’s Advocacy programs is to advance policies throughout Oregon that have the best potential to improve outcomes for communities of color. To achieve our goal, we are committed to building the capacity of our members and communities of color to successfully advance policy agendas, reform policy practices to ensure authentic community engagement of the communities most directly impacted by policy change and to shift political discourse to centralize the voices of communities of color in policy. During the 2017 Legislative session, the Coalition, our members and coalition partners had significant advances in reaching our advocacy goals and we look forward to continuing to build a movement for positive change in the upcoming session. Early Childhood Education Equity Fund, led by the Latino Network, supporting culturally specific early learning services to close the opportunity gap for children of color in communities throughout our state. Small donor elections, creating an alternative to Oregon’s existing campaign finance system to give small donors a more powerful voice in elections, potentially helping to elect more candidates of color and building the power of communities of color. Clean Energy Jobs, accounting for the cost of pollution and reinvesting substantial proceeds into most impacted communities. We are advocating hard to center environmental justice and equity in this important bill, which has historic potential to address the impact of climate change on communities of color in Oregon. The legislative session begins February 5 and must adjourn by March 9. Bills move on an extremely tight timeline, so we anticipate a month of busy advocacy in Salem to move a racial equity agenda. We’ll be releasing the Racial Equity Report Card, an important advocacy tool, before session begins. We will also be holding another CCC Legislative Action Day on February 8. Last year, we had over 150 attendees come to Salem and meet with legislators on our legislative priorities, helping secure the passage of many bills to advance racial equity in Oregon. If you want to participate, contact Jenny Lee at jenny@coalitioncommunitiescolor.org for more information. Oregonians aren’t used to voting in January, but next month a critical special election for healthcare will be held. Voting yes on Measure 101 will protect healthcare for Oregonians who could not otherwise afford it. CCC members are still determining their endorsement, with many of our members deeply concerned about the impact that this measure would have on healthcare for communities of color, so we are spreading the word now. Learn more about the campaign at yesforhealthcare.org. We did see a success on the ballot this November—the Portland Community College bond, which passed by a large margin. As we move forward into the new year, we will continue to advocate for ballot measure campaigns, local government measures, and budget advocacy impacting communities of color. November was National Native American Heritage Month. The Coalition of Communities of Color is taking this opportunity in Equity Lens to highlight some notable achievements among Oregon's the Native American community. The Portland Metro Area sits on the traditional sites of the Multnomah, Wasco, Cowlitz, Kathlamet, Clackamas, Bands of Chinook, Tualatin Kalapuya, Molalla and may other tribes. Today our community represents over 380 tribes from across the country and 70,000 of Portlanders (a 16% increase in ten years). While our peoples have faced elimination, assimilation, and termination, we are now numerous, our stories are powerful and we are thriving. Unfortunately, our community still faces wide disparities like the highest rates of poverty, homelessness and unemployment of any racial group; disproportionate rates of addiction, diabetes and depression. Too many of our Native children are in the foster care system (24%) and do not graduate from high school on time (63%). Our communities are still undercounted and misunderstood leading to inequities in services and outcomes. However, Portland Metro’s Native American community continues to grow, thrive, innovate, contribute, and celebrate our heritage. We are working with our local jurisdictions, creating programming and tackling these disparities head on. We are building a collective vision for our children’s future and building stronger connections among the community. 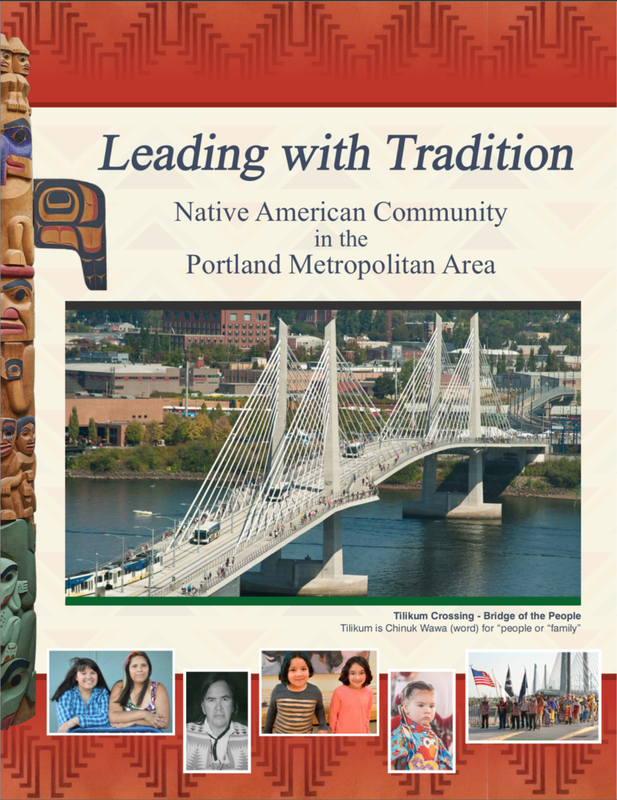 “We have important and diverse indigenous values and worldviews that contribute to the livability and uniqueness of Portland, and we see ourselves as part of its future.” We are not invisible, the report reiterates; we are building our collective future leading with tradition. Congratulations to NAYA Family Center on the success of the 14th Annual NAYA Gala & Auction! We spoke with two Multnomah County staff, Anna Marie Allen, Shoshone-Bannock (Community Engagement Advisor, Chair Kafoury’s Office) and Oliviah Walker, Meskwaki (Senior Policy Analyst, Health Equity Initiative - ‎Multnomah County Health Department) about the plan. Anna (LEAD Alumni ‘14) and Oliviah (LEAD Alumni ‘17) supported the coordination of a series of conversations between county and community leaders. “County leadership is always looking for authentic ways to bring in community voice to shape and inform policy. Our current Board of Commissioners is diverse in their heritage and personal experiences. They are dedicated to centering community-driven policy priorities.” Chair Kafoury was eager to accept PILR’s request to partner on this plan when she sat down with them last April. Department staff and leadership have been eager to learn best practices and identify intersections with their work. “Our hope is to come together under the values of authentic partnership to continue to elevate the needs of Native American/Alaska Native residents and ensure community-led priorities continue to receive support,” the draft reads. 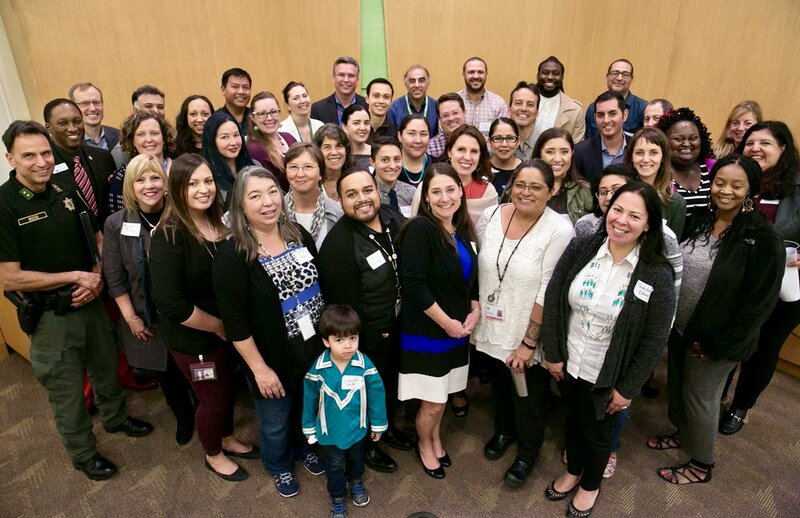 Multnomah County and the Native community are already partnering on programs like Future Generations Collaborative, WIC services, SUN Schools, Mental Health and Addiction Services, Native American Heritage Month, Community Health Improvement Plan, transitioning Columbus Day to Indigenous Peoples Day, and more. The draft plan also outlines priority areas for increased partnership and improvement: culturally specific community engagement practices, maternal child health and elder services, housing strategies, early intervention and restorative practices that reduce youth incarceration and recidivism, and culturally responsive trainings for Multnomah County staff. Very quickly, we learned local jurisdictions have separate and distinct obligations to Tribes and to Native American communities; jurisdictions must have experience and expertise to recognize these unique responsibilities. Each relationship must be grounded in the leadership of Native peoples, in honest and authentic partnership, and a recognition of historic and current injustices resulting in inequitable outcomes for Native American communities. The plan and partnership, at first glance, seemed like a clash of two worlds. In fact, it was the integration of different worldviews and a prioritization of Native values that helped facilitate the process. The plan has been a concerted effort to center and authentically reflect voices of community while avoiding overtaxing or re-traumatizing communities and individuals that have been historically traumatized by systems. The Native American community is diverse-- mutl-tribal and mutl-racial-- and individuals have diverse experiences of privilege and oppression. Thus, community engagement must reflect this diversity. Engagement and recommendations exemplify a strengths-based approach, recognizing the contributions of the area’s Native American community, while intentionally focusing on improving outcomes for community members most in need. Oliviah added “Community engagement is not organization-specific, but community-wide thus ensuring every division and department has a community engagement strategy (again without overburdening community)... There are a lot of reports [like those from the Coalition of Communities of Color] that talk about existing disparities, but it’s really about aligning those efforts and having one place to tell the story of partnerships that have happened between the Native Community and the County. What’s going to drive the work over the next five to ten years?” This plan is both a continuation and a start. The horrific Max attack on Memorial Day weekend, opened the eyes of Portlanders to the experiences that people of color, immigrants and refugees, religious groups and the LGBTQ face as hateful rhetoric gets amplified at the national and local levels. Portland United Against Hate is a community initiated partnership of Community Based Organizations, concerned communities and the City, working with the Office of Neighborhood Involvement to build a rapid response system that combines reporting and tracking of hateful acts and provide the support and protection our communities need. Communities experience hate motivated violence in a variety of ways and there’s a need for a documentation process that enables those most impacted to be able to track hate incidents in a trusted manner. We firmly believe that communities are experts of their experiences who have a right to lift their lived realities as data. Therefore, the CCC in partnership with IRCO-Africa House, IRCO-Asian Family Center, Latino Network, Resolutions Northwest, Unite Oregon, Urban League of Portland and the Q Center completed seven intersectional and cross-cultural conversations with 75 participants in August through October in a project funded by the City of Portland, Office of Neighborhood Involvement. Topics of the focus groups included: what hate is and what it looks like, experiences reporting hate crimes and incidents, and what a successful hate crime and incident reporting process would look like. Hate looks like hateful speech and symbols, threats, physical attacks, stereotyping and profiling, and unequal access to resources and opportunities. Hate is systemic, and can manifest within groups and communities. Support is sought from family, community groups, religious leaders, and spiritual healers. However, many are unaware of what resources and supports are available, or do not have access to them. Hate may be prevented by recognizing what it looks like and how it manifests, education and learning about other groups and histories, and through intervention from bystanders when hate is occurring. Hate often goes unreported because of the feelings that attention is not given to incidents or these incidents are not taken seriously, the issue is often left unresolved, people in positions of authority may be the perpetrators, and reporting the incident may cause further harm. That the reporting process be person-centered and honor the narrative of the person who had experienced hate to aid in the healing process. That the reporting process not be re-traumatizing or cause more harm. That the reporting process is action-oriented. For more information about this initiative and the full report, please contact Shweta Moorthy at shweta@coalitioncommunitiescolor.org. The law fills a critical gap in our children’s education in Oregon, requires the teaching of American Indian/Alaska Native History & Sovereignty in all K-12 schools by 2019-2020. Governor Kate Brown held a signing ceremony with tribal leaders from around the region for Senate Bill 13 earlier this fall, requiring school districts statewide to implement curricula developed by Tribes in Oregon covering tribal history and sovereignty. 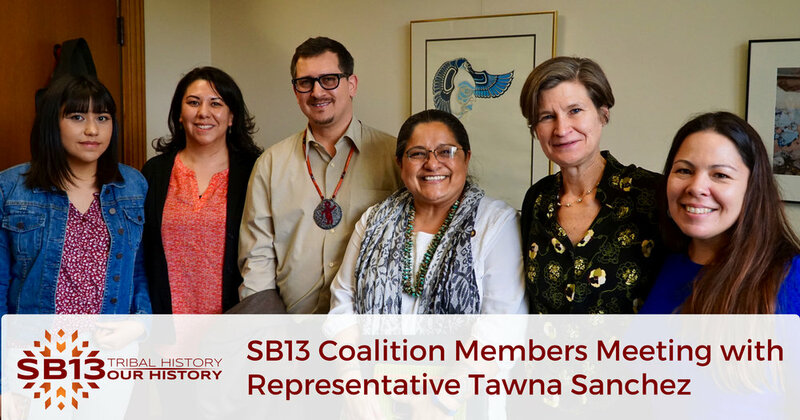 Carried by Representative Tawna Sanchez (Shoshone-Bannock, Ute and Carrizo), and at the request of Governor Brown, the bill passed both chambers of the Oregon Legislature with unanimous support. Western States Center was the coalition convener of the effort in support of the bill and took a movement building approach to our work by recognizing and centering the benefit for every Oregon student as the bedrock of our future body politic. Oregon joins other states in our region like Montana, Washington, Wyoming and Idaho in building a fundamental understanding of tribal literacy and history among its K-12 students. The law is one piece of the eleven-point plan of educational objectives established by the Oregon Department of Education’s American Indian/Alaska Native Advisory Panel. This plan is the product of that process and is a road map for state efforts to improve opportunities and outcomes for Native American youth in Oregon. Western States Center builds the capacity and skills of community organizers and organizations working for racial and gender justice across the region. We envision our movement achieving a just society where we all flourish in sustainable, caring and connected communities. Learn more about our work at www.westernstatescenter.org. .
is a poet, and other contributions to Portland’s art scene include being a performer and assistant director at Teatro Milagro, a writer for Voz Alta, and a member of Profile Theatre's Community Council. Santos is also a Manager of School-Based Programs at Latino Network.